The Splash Dash is a local 10K/5K run and walk event. This was Lifestyle PT’s 3rd year in a row participating in the race. 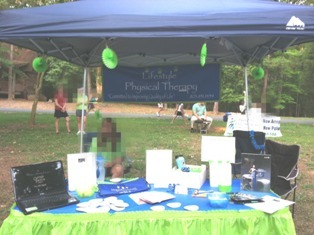 This year, Lifestyle was a sponsor and hosted a booth at the event along with participating in the race. We had 3 runners, 10 walkers and 3 people running our booth. Congratulations to Luke, a staff member’s 11 year old son for finishing the 5K in 25:29, 26th overall. And Neena, a staff member’s niece for getting 1st place in her age group! Our booth showcased our new Alter G Anti-Gravity Treadmill. We held a drawing for 3 prizes and we want to congratulate Kristy D. for winning the Grand Prize of a Lifestyle Tshirt, Lifestyle Travel Mug, Biofreeze roll-on and 10 free minutes on the Alter G. Our second place winner was Nancy H. and third place was Jeromee J. Thank you to all who visited us at the Splash Dash and we look forward to next year’s event!